I have some fun Earth Day ideas for you today! 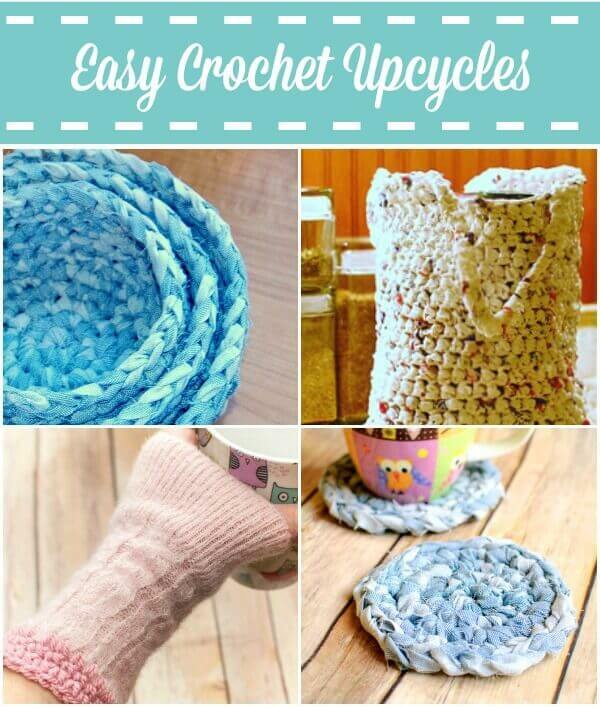 Use your crochet skills to upcycle everyday items that otherwise would end up getting tossed. Old sweaters with holes, worn sheets or fabric remnants, T-shirts past their prime, and even plastic bags all can be given a new life and turned into other useful items. Here are some tutorials, patterns, and project ideas to get you started. oh, I love a good upcycle! Great list of projects! Those nesting baskets are my fav! They’re one of mine too. Thanks so much, Melanie! What fabulous upcycling ideas – I used to have a pencil case made like that when I was a child in the 70’s.